It’s been 5 months since we’ve been home from the hospital. Some days, it feels like just yesterday. Like when I have flashbacks of being wheeled through the ER doors and onto the helicopter; when I panic at the thought of heights when I’ve never had this fear before. When I remember arriving at the hospital and not knowing a single person in the room. When I recall the looks on the faces of our nurses and doctors when Jax was born 17 weeks early and oh! they were scared, too. Or when I look at a picture of Jax when he was first born and see the tube down his throat. Or when I remember the way he looked right before he needed another blood transfusion, pale and limp. I see him struggling to live and I am there again. Through all these good times, it’s hard to remember where we started. The NICU – the alarms, the monitors, the blood, the infections, the medicine, the oxygen, the statistics, the “what-ifs.” All that scary stuff? I could do without. But, it’s impossible to forget the compassion and skill of the doctors and nurses that saved Jax’s life. It’s hard not to be thankful for the Family Support Center where we could go get a cup of coffee or find a book in their library that would help us understand what Jax was doing that day. We are so thankful for the Financial Services staff that helped us navigate all the health insurance forms and other applications. I am grateful the lactation consultants encouraged me even when my milk supply was dwindling. I look back on my financial statements from that time and I am amazed that a program through the hospital helped reduce our parking fees from $4 a day to $1 a day, which, believe me, made a huge difference. Most of our pictures from the NICU are of us snuggling close on the Kangaroo Chair – a reclining chair that made Kangaroo Care even more comfortable and awesome. All of these things helped make our stay more comfortable and manageable and they were made possible by donations from people like us. And that is why we want to give back. It’s our turn to help ease another family’s burden. By participating in the Baby Steps 3K we will be able to raise money to support the Neonatal Program at Children’s Hospitals and Clinics of Minnesota. Funds will be used for things such as education for staff and parents, purchasing breast milk for babies whose mothers aren’t able to produce enough for their baby (which was me, more about that later! ), meals for families, memory items, books, and the purchase of more Kangaroo Chairs. Will you join our team and help us make a difference close to home? Will you help us pay it forward? Even if you can’t (or don’t want to) fund-raise, we’d still love for you to come walk with us, meet Jax’s care team, and show your support for Jax and all the other babies that have or will someday benefit from care in the NICU. Thank you, as always for your love and support! Both my baby’s where prem and I can understander how grateful you are as I could never praise the staff enough as I’m sure you feel the same. Oh yes! 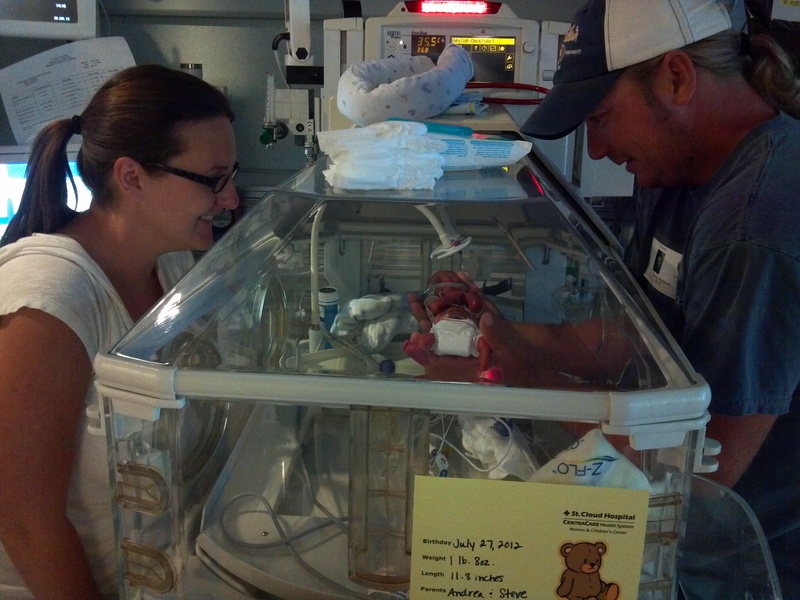 NICU nurses and staff are special people. They definitely have a calling to do what they do. So grateful! I look at my oldest who at one point they where concerned would not make it the day. He’s nearly seven he has some left over issues hearing loss and kidney problems but to see him you never know he was prem baby I take him each year to the scbu And we take stuff that they can always use. Your little one looks so well and you done a wonderful job. Little one must have the little fighting stubborn trate only down side is that later on the thing that kept them alive can be the thing that drives you up the wall but us mums know how vulnerable they can be. Enjoy as from now on wards no matter how hard it can be its all fun. And Jax is very cute . I am not overly happy with the stubborn ,feisty streak of kierren but I know when things are tuff as sadly are babies do have a struggle to catch up till there about ten so studies and most teachers I know say. But that down side has a huge up side it helps them throw but my gosh sometimes I would trade it for a settled none feisty child. Ps not just two and teens with boys it’s two teens and six and half seven. If you even stuck and would like advice I’m always willing to if it was not for other mums of prem babies at times I be going insane. Luckily having one of three and one of nearly seven iv got a lot of knowledge now. Your right there come 2you not be over joyed but sadly six and half seven again with boys and teens I’m told teens as Iv not hit that stage yet with mine. But the same thing that makes us want to scream also the thing that helps them with added problems they have because of there early fight. Both mine have added problems Kai my youngest had a stroke at nine weeks old. And all prem children have a delay till there around ten -twelve studies and teachers Iv spoken to have said. Any way if you need any advice as I know from my two no better advice then a mum that’s been there as they understand and no more in some ways then the doctors. And as mine are 3and nearly 7 I’m good at this stuff.